This is one of those recipes that I have trouble posting because looking at the photos makes me want to go make it again. So good! It’s basically a portobello burger (do you call them portobellos or portobellas? I’ve seen it both ways, I’ll stick with O for now.) with vegan mayo (add chipotle to make it spicy! ), lettuce, tomato, and a bunch of shoestring onion rings – totally indulgent gourmet burger fare but with a lot less fat than you might expect. It’s also pretty easy – the most involved part is making the breaded onion things, but you can also have a bunch of regular onion rings as a side dish so it’s worth the time. 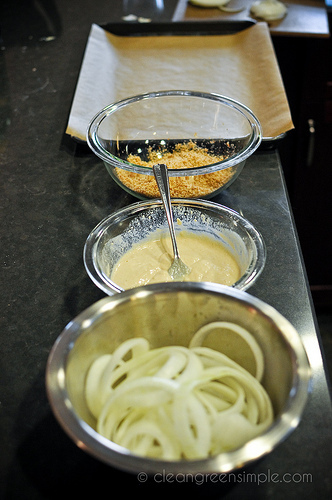 The burger would totally work without them, but who wants to pass up the opportunity for crazy delicious onion rings? For the onion strings, it’s basically just Isa Chandra’s recipe but instead of slicing the onion into 3/4 inch slices you slice it as thin as you can and then cut the slices in half. Dip them in the sauce and sprinkle them with a bunch of bread crumbs. It’s ok if they kind of stick together in a big mass – you can separate them a bit after you bake them. For two burgers I used about a third of a big onion. You can slice the rest of it into rings and just make the regular onion ring recipe as a side dish. In the photo below the onion strings are on the left and the onion rings are on the right – I used one big onion and had this sheet and another cookie sheet full of onion rings. Serve while everything is still nice and hot and enjoy! What are your favorite burger toppings? Any suggestions I should try? Vegan, Low Fat, Gluten free if you use GF buns & breadcrumbs, soy free, Refined Sugar Free Onion Ring Recipe from The Post Punk Kitchen. 1 cup whole wheat bread crumbs I just toss a hamburger bun in the food processor to make about a cup of breadcrumbs. If you are using a GF hamburger bun that should work great. Preheat oven to 450 degrees. Combine flour, corn starch, almond milk, and apple cider vinegar in a medium bowl. Peel your onion and slice about a third of it into very thin rings (as thin as you can get them) and then cut those rings in half. 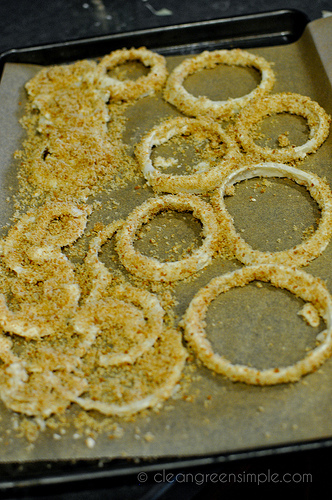 Slice the remainder of the onion into 3/4 inch rings to make onion rings. The breading process is roughly the same for the strings and the rings - dip the thin onion slices into the flour/almond milk mixture and then sprinkle thoroughly with breadcrumbs. Try not to get the breadcrumbs wet or they won't stick as well (so the idea is to sprinkle them over the wet onions, as opposed to dipping the onions right in the bowl.) Set them on a well-greased or parchment lined cookie sheet. Bake for 8 minutes on one side, flip, and bake for an additional 6 minutes on the other side, or until they are golden brown and crisp. 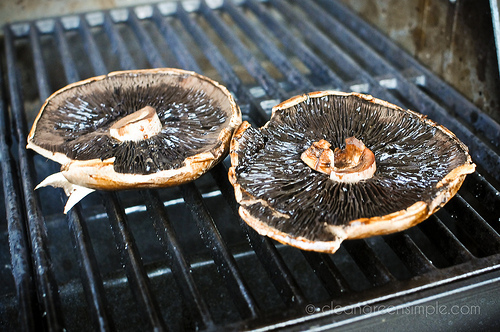 While the onion rings are baking, heat your grill to medium and brush your portobellos with balsamic vinegar. Oil your grill and cook them for 3-5 minutes per side or until they are slightly softened and browned. You can also toast your buns by putting them on the grill for about 30 seconds, if you want. Once your onion strings and portobellos are done assemble your burger - about a teaspoon of chipotle mayo, lettuce, portobellos, onion strings. Serve and enjoy! 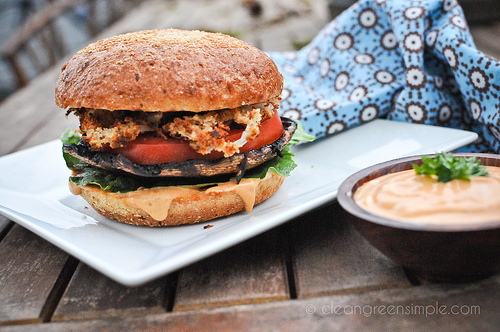 I was astounded when I saw the vegan mayo yesterday… but now you’ve REALLY done it! 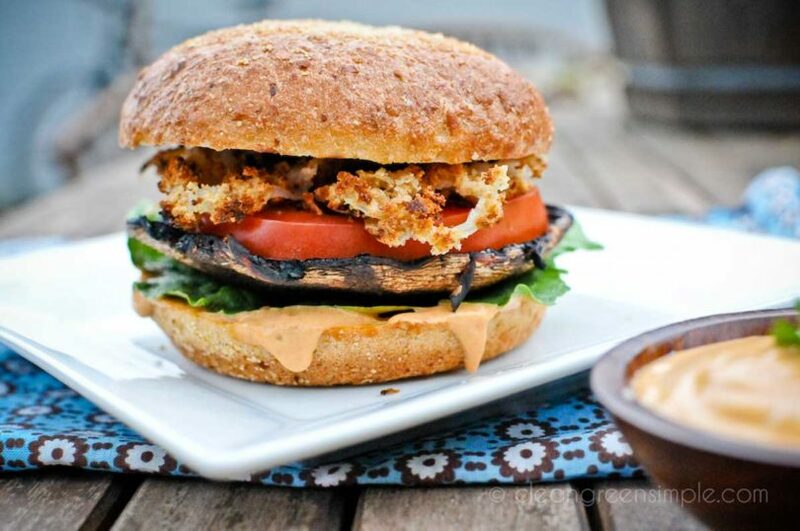 What lovely portobello burgers! Will you be my new best friend? Looks great, I love portabello burgers…such a staple around my house during the summer! yum! congrats on the top 9! These look excellent! I am now having a hard time deciding what to make for dinner, eggrolls or this recipe! Grrr. Yum! Reminds me of a similar recipe I have. Congrats on top 9! Love portobella burgers – love the vegan chipotle mayo – never had it this way. That looks phenomenal! Seriously I want one of those for dinner now! haha…Congrats on the top 9!! Beautifulness! It looks so delicious and I love how it’s so easy to make 🙂 Congrats on the Top 9! 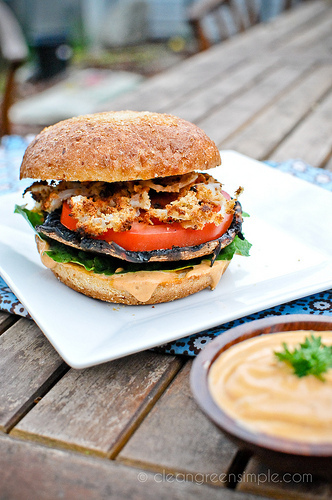 If I would have known how easy portobello burgers were to make, I would have made them! Yours look amazing! I’m not even a vegetarian and these look delicious! Bring on the summer! 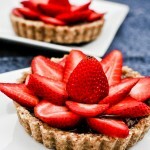 Love your blog & recipes! Buzzed this!!! I’m not a vegetarian and have always been hesitant to try mushroom burgers cuz I love the real thing. However, I finally got up enough nerve to give them a try, and now, I am TOTALLY ADDICTED! I don’t even need a bun – just serve me the grilled bellas topped with chopped tomatoes, basil, and any kind of cheese (provolone, blue, parmesean, havarti, cheese, cheese, cheese). I’m glad the Pioneer Woman posted your recipe.. 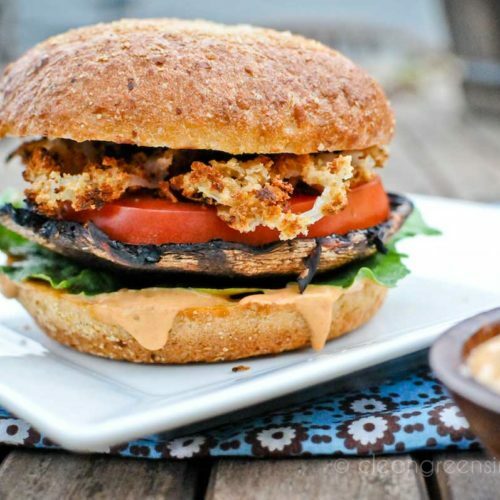 I love portobello mushrooms and a portobello burger is so yummy! Made these the other night- my husband and I loved them! I am (very) allergic to soy milk. 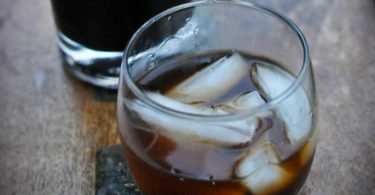 What kind of non-dairy milk can I substitute and get the same consistency? I used oat milk, which didn’t work at all…it was super runny! Has anyone had a successful mayo with another type of milk?